Thermal Supply’s Fife training center offers an abundance of materials available to all contractors. With monthly Daikin training on Residential, Light Commercial, and VRV Commercial equipment, Thermal Supply is the only supplier in the Northwest market to have an in-house certified Daikin trainer for all Mini-Split and VRV Equipment. We are currently offering certification training in the following fields – RLC Installation, RLC Service and Troubleshooting, VRV Installation, VRV Commissioning, and VRV Service and Troubleshooting. We will also be adding a non-certification based training syllabus to our 2016 sales schedule that will be directed towards office personnel such as Engineers, System Designers, Estimators, Project Managers, and even owners who are interested in learning more about Daikin. Our non-certification modules consists of several options – An overview of RLC and VRV products, Daikin City resources, design tools and energy calculator software, and whole building controls solutions. Whether you work in the field or the office, Thermal Supply will have the right training for you. 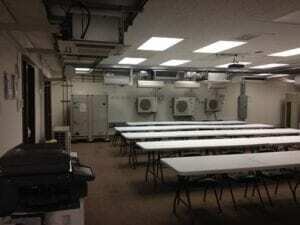 Upon attending one of our training in Fife Washington, you will quickly notice that all of our equipment has been recently updated to reflect Daikin’s latest product release and development. As Daikin continues to lead the market in Inverter Technology, Thermal Supply is continually updating our personnel with the latest training that goes hand in hand, so that when you call, we have the answers. Thermal Supply offers a vast variety of manufacturer’s training aimed at keeping contractors up to date with recent changes in technology. This year we plan on holding several special event training sessions, including but not limited to, Goodman, Bard, Emerson/Copeland, JB Vacuum Pumps, Manitowoc, Sporlan, and Packard. To find out more information about upcoming training, please contact our Training Administrator, Kim Becker, at 253-926-1807 or by email at KBecker@thermalsupply.com.